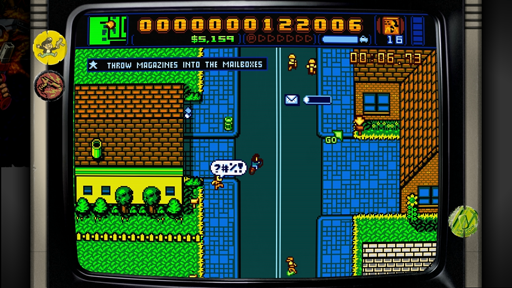 Thanks to VBlank, I got my hands on a copy of Retro City Rampage to review, so let's dive right in! Easily the first thing you notice is the super retro graphics. If you don't like that style, then A. you didn't play games in the 80s and B. this isn't your game. For the rest of us, this is a faithful throwback to the games of yesteryear. I like the 8 bit style, but my favorite by far is the Nintendo-looking cut-scenes (see the next picture below for an example). I loved those on the NES, and they look just as good here. Another great thing included in the game are several filters. 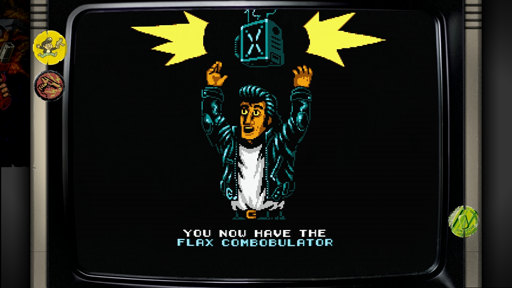 It can change the arcade cabinet frame (if you have it), and slightly change the graphics to emulate the old systems. My personal favorite is the gameboy filter. The playable screen is smaller, but it looks exactly like an old Gameboy game, and the music and sounds even change! I'm a fan of small details, and the attention to detail in the filters gets my approval. As is the case with the graphics, the music is also very retro. They sound just like they came right out of an old NES game, which is a perfect fit. Another cool touch is the different radio stations in the game when in a vehicle. There's actually a fair bit of music in this game, which I did not expect. The controls are pretty good. The only issues I have is the auto targeting (hold attack) sometimes picks a seemingly random target. Also, at first I had the vehicle controls on manual, which was very awkward. You turn the car based on it's orientation, which works when not in top down, non rotating view. After switching it to automatic, the vehicles controlled exactly how I wanted, so that problem was solved fairly quickly. Another issue I have with the game is the difficulty spikes. A few missions were completed with no difficulty, but a few had me swearing at the screen. Occasionally, this was because the mission objective was not clear. An example: the mission said "Use dynamite to clear traffic". I have a timer, but what it wants is for me to blow up 20 cars. This counter is up at the top of the screen and didn't stand out until I looked around trying to figure out why I failed the mission the first time. This problem also occurs in the arcade challenges. Most start out with some objective that may or may not help you understand what you have to do to score/get medals. It's frustrating to be sure, and there's no extra help in the game. Very retro to a fault. Getting the trophy for getting all golds will involve a lot of retrying, that's for sure. After doing the first few missions, I saw my completion percentage was in the teens. That was a bit misleading, since there are over 60 missions to do and many "arcade challenges". Usually these involve using a certain weapon to get x kills or y points or other various timed challenges. I like that these can be done on the map, or from the main menu, if you are just looking to get those gold medals without tracking down its location after unlocking it. While some of them are frustratingly difficult, there's lots of other stuff to do to blow off steam (read: run over tons of people). There's even an arcade that has 3 parody minigames and several collectibles (my favorite is the invisible walls). Just like the GTA games, there is a huge chunk of things to do, or even just spend time screwing around. If you buy the game on the PSN, you get the PS3 and Vita versions, which is amazing if you happen to be one of the 10 people who has a Vita. A great touch is the Free Roam mode gives you max money to start, which means you can buy weapons and other crap to your hearts content. That's great for pick up and play. The trophies have several "get them for doing next to nothing", but several involve skill. I'm not likely to get the gold medals on all challenges or a 99x multiplier, but the rest should be obtainable for most gamers. Yes, paper boy. Yes, they still try to kill you. If you enjoy parodies (which I very much do), I think every screen of this game has some sort of reference to something else. Some are far more direct than others, but I didn't feel they were forced, since the point of the game is to make reference to tons of stuff from the 80s and 90s (also a few current things). You can purchase lots of custumization options for Player (yes, that's his name), including hairstyles and hats. You can even play as unlockable characters in the Free Roam. One last small touch (since I like those so much) that I loved was equipping the "Biffman" suit and using "Biffarangs". When you attack with them, it bothers to write out the Adam West Batman sound effects. Yes, it is as awesome as it sounds. So, last and not least: is it fun? Yes. Even though there is lots of frustration with the challenges and some missions, the GTA-like structure of the game means you can just run people over until you feel better. Or just wander around finding parodies. Getting the PSN version is what I'd recommend if you ever think you will get a Vita, since you get a "twofer". In closing, what I really want to say to everybody is: If you grew up in the 80s and 90s, you need to at least try this game! There's so much content and so many references crammed into the game, this really is a love letter to 80s gaming, so go ahead and read it.